Brand New Classic Ford Broncos are now available for sale. In about a year you’ll be able to buy a new Ford Bronco that’s looks just like the original. But if you get tired of waiting, you can by an original Bronco that’s brand new right now. Gateway Bronco of Hamel, Ill., which started out as a restoration shop specializing in the classic SUVs just over two years ago, has been granted the first license from Ford to build ground-up recreations of Ford Broncos from 1966 to 1977. This allows them to manufacture vehicles with all-new frames and bodies and sell them with Ford Bronco branding, even though you’ll find that they are a little different from the classics under the skin. Gateway will continue to sell their resto-mods, and will update their Broncos with upgraded suspensions, brakes and engines, using either a 347 cubic-inch “stroker” V8 or a 5.0-liter Coyote from the current F-150. Several models are for sale that run from the $95,000 Fuelie to the $180,000 Modern Day Warrior, which is equipped with the six-speed transmission and rear suspension from a Ford F-150 Raptor. They’re also equipped with a noise and vibration reduction system engineered by Gateway and can be trimmed in high-end woods, leathers or anything the customer wants. Founder and CEO Seth Burgett told The Motor Masters that a $250,000 model is being added to the mix that comes with either a Shelby supercharger or a Gateway-designed twin-turbocharger, along with other performance upgrades that include a Borla exhaust and Brembo brakes. They won’t be the only classic Broncos modified with Shelby parts. 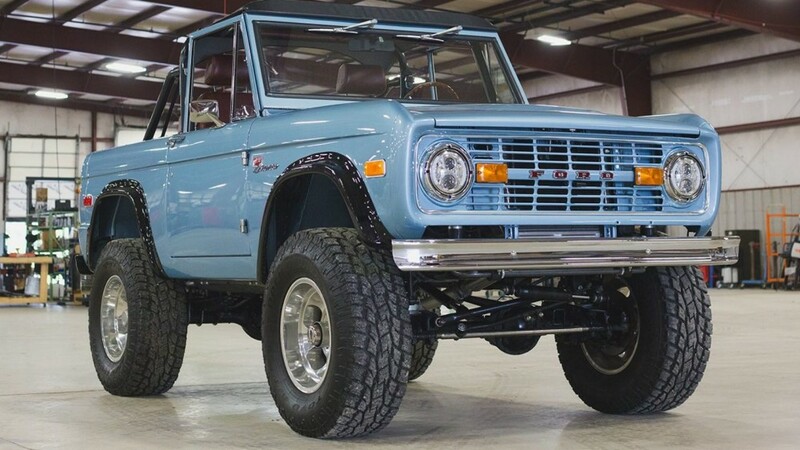 Back in 2016, Burgett purchased the first Bronco that was ever built, which was originally owned by Carroll Shelby himself, who wasted no time swapping a Mustang Hi-Po 289 V8 into it. The agreement with Ford is so that they can take advantage of a new law that allows for low volume vehicle manufacturers to build 325 cars annually that qualify for a federal VIN without having to meet current safety standards, as long as they are a licensed replica of a vehicle that is at least 25 years old. The legislation was passed in 2015. However the final regulations have yet to be written and put into effect. Currently, Broncos can be built to state-by-state regulations that cover custom car registration. Gateway is ready to build them now. It already does its restorations using an assembly line process that has built over 40 trucks so far, and Burgett said it is being expanded to handle 50 yearly as production of the all-new trucks ramps up. The Motor Masters Restoration Shop can restore your classic SUV or classic car.